While the East and West Coast get most of the attention for technological advances, there is an entire tech revolution happening across America. By way of example, farmers are using drones and sensors to monitor their crops and doctors utilizing tele-health initiatives to those living in remote areas during health epidemics. We are watching a transformative moment in America. 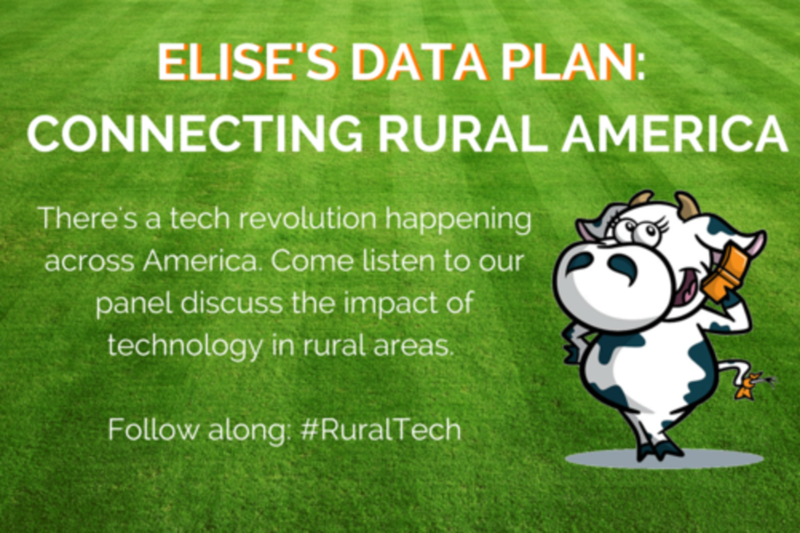 Come listen to our panel discuss the impact of technology in rural areas, featuring Senator Jerry Moran, a leading advocate for tech in Congress, along with representatives from rural broadband providers, a leading tele-health pioneer, and a counsel to competitive mobile broadband operators. Billy is a member of the House Energy and Commerce Committee. He serves on three critical Energy and Commerce Subcommittees: Communications and Technology; Energy and Power; and Health. Eric Woody, Chief Technical and Operations Officer at Union Telephone Company/Union Wireless oversees the Engineering, Operations, Construction and Maintenance groups. Eric graduated from the University of Wyoming's Electrical Engineering Program and has over 20 years of experience in the Telecommunications Industry. Eric also spent 8 years in the United States Navy as a Nuclear Qualified Electricians Mate in the Submarine Service. Eric and his wife Susan, along with their 4 children have strong ties to the local Bridger Valley community, where they have enjoyed living nearly their entire lives, including supporting local charities and activities such as The Boy Scouts of America. Dr. Henderson is the Vice President for Telehealth & Innovation at Seton Healthcare Family in Austin, Texas. Prior to this role she was the Chief Telehealth & Innovation Officer for the University of Mississippi Medical Center (UMMC) where she led the development of a statewide telehealth program, which is recognized as a national model. A few of her accomplishments include: 2015 Mississippi’s 50 Leading Business Women, 2013 Robert Wood Johnson Nurse Executive Fellow, the 2014 Nurse Innovator of the Year, 2012 Advanced Practice Nurse of the Year, and voted an "Edge Runner" by the American Academy of Nurses. As a recognized leader in healthcare innovation, she has testified before the U.S. Senate Committee on Commerce, Science and Transportation’s Subcommittee on “Advancing Telehealth through Connectivity,” as well as the Subcommittee on Rural Health and the White House Domestic Policy Council. She has made numerous presentations across the country to advance telehealth policy and practice, including giving a TEDx talk in November 2014 and being selected to speak at the 2016 SXSW event in Austin next March. Her other leadership roles include service as a board member of the American Telemedicine Association; executive director of the Mississippi Telehealth Association; and board member of the Mississippi Health Information Network. She is also a Fellow with the Emergency Nurses Association. Henderson received her Doctorate of Nursing Practice degree from the University of Alabama at Birmingham; her master’s degree in nursing from the Mississippi University for Women; and her bachelor’s degree in nursing from Mississippi College. She maintains national certification as a family and acute care nurse practitioner. Rebecca Murphy Thompson is Executive Vice President and General Counsel of Competitive Carriers Association (CCA), the nation’s leading association for competitive wireless providers serving rural, regional and nationwide markets in the United States. In this capacity, she helps to lead the association’s legal agenda and coordinates and executes CCA’s regulatory advocacy on issues impacting competitive carriers, including spectrum access, interoperability, interconnection, roaming, public safety and Universal Service Fund reform. •	Named 2015 Most Influential Women in Wireless “Woman to Watch” by FierceWireless. •	Nominated 2015 Excellence in Advocacy Award by Professional Women in Advocacy. •	Named 2014 Legal 500’s Corporate Counsel 100 Rising Stars. Experience. Prior to joining CCA, Thompson worked as an Associate for Patton Boggs LLP. With more than 15 years of experience in the telecommunications industry, Thompson has represented communications companies and technology vendors in regulatory, transactional, policy, bankruptcy and general corporate proceedings before the FCC, the Department of Commerce, the Department of Justice, the FTC and other state and federal agencies. Education. Thompson is a graduate of Drexel University and received a law degree from Catholic University. •	Elected to the Board of Directors of the NG9-1-1 Institute, a not-for-profit 501(c)(3) organization that works with the Congressional NextGen 9-1-1 Caucus to promote deployment of advanced and effective 9-1-1 and NG9-1-1 services throughout the nation. •	Appointed to serve on the Federal Communications Commission’s North American Numbering Council (NANC), the federal advisory committee established to advise the Commission on policy and technical administration of numbering resources.